Protect your family with solid estate planning Estate planning sounds difficult--but most people just need a few basic documents. Let Plan Your Estate show you how to protect your loved ones from legal hassles and financial uncertainty after your death. Learn about: wills and living trusts avoiding probate bypass (AB) trusts naming guardians for children leaving property to children estate, gift, and inheritance taxes strategies for business owners leaving property to charity health care directives, and financial powers of attorney. 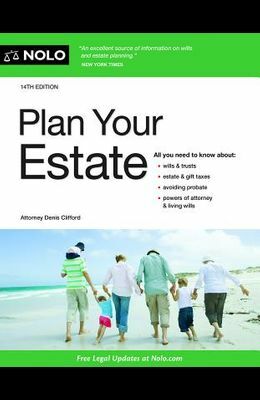 The 14th edition of Plan Your Estate is completely updated to reflect the latest state and federal laws, including the Tax Cuts and Jobs Act of 2017. Applies in all U.S. states except Louisiana.